The first U.S. government shutdown in 17 years means more than just scores of federal employees being forced to go without paychecks, the closure of national parks, and an end to the Panda Cam. It will also likely cause a great deal of headaches for the industries regulated by the government, and that includes the auto industry. Will the government shutdown somehow cause an end to new car sales, used car sales, and driving as we know it? No, but we could see delays in important regulatory matters like emissions and fuel economy certification, safety recalls, and crash tests. As of today, less than 24 hours into the shutdown, it's unlikely that these issues could cause real problems for the automakers. But if the shutdown is allowed to drag on for weeks on end as it did in 1996, it could lead to delays in getting newer cars into showrooms. Some also speculate that it could dampen new car sales, but that remains to be seen. Let's take a look at some of the known issues car companies will face with the shutdown in effect. Though that tweet came off as somewhat ridiculous this morning, it does indicate that nothing will be going on over at the National Highway Traffic Safety Administration. They won't be issuing any new auto safety recalls or investigations into defects during the shutdown or posting updates to existing ones. Of course, recalls will still happen. Many recalls are initiated by the manufacturers themselves, and they are often disseminated to the public through press releases. But NHTSA won't issue their own, and they won't update their website about new recalls from the car companies. Here's another wrinkle. 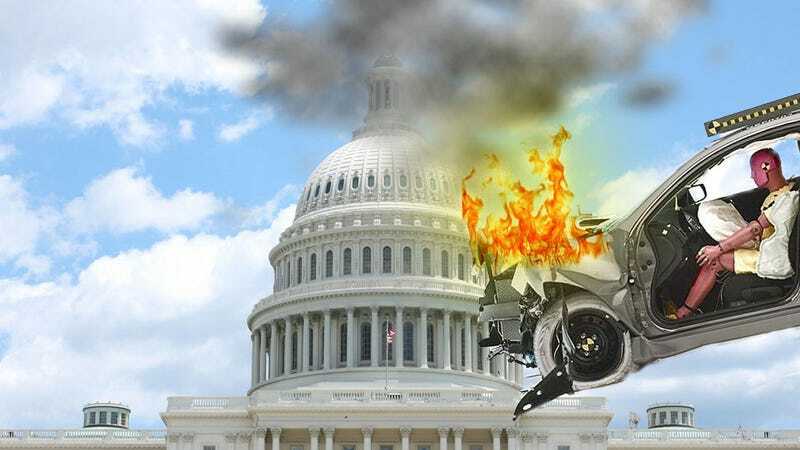 With NHTSA shut down, that means no new crash tests for a while. The agency will also halt the release of crash test data and star ratings. This could delay testing for 2014 model cars, which could lead to delays in getting those cars onto dealer lots. Again, this all depends on how long the shutdown drags on. If it's a few days, it probably won't be much of an issue. But if it is allowed to continue for weeks and weeks, it could really present a problem for automakers trying to get their volume models out. Does this lack of crash testing and recall notices mean huge safety problems could slip past the powers that be and put the car-buying public in danger? That seems like a very extreme and even unlikely case, but it's not good to be where we are at now. Gabe Nelson over at Automotive News recently pointed out that new cars could be delayed by another regulatory issue: with the Environmental Protection Agency shut down, no new emissions certificates can be issued for cars and light trucks. He writes that many cars already have their certificates for the 2014 model year, but some do not. In the first week of October last year, the EPA approved 14 emissions certificates for light-duty vehicles. The following week it approved about 30 more. It’s a trickle, not a flood; if the government shuts down for just a few days, the EPA staffers who review certificates would hardly face a crushing backlog when they returned. But a longer wait could mess up launch timing. Just ask Mazda, which said this month that emissions testing delays were the reason the diesel variant of the Mazda6 sedan will go on sale in the late spring of 2014 rather than this year. Will People Stop Buying New Cars? Then there's the question of how the government shutdown will affect auto sales in general. That's hard to say. If your paycheck is tied to the federal government, it's pretty clear that you probably won't be pulling the trigger on a new car until you start getting paid regularly again. I'd be very curious to see the shutdown's impact on auto sales in the D.C./Virginia/Maryland region. But it seems uncertain whether the shutdown will put other people off buying new cars. As Matt mentioned in today's Morning Shift, October sales could be down as much as 4.4 percent according to some sources, but that decline could also be an after-effect of several months of strong sales and fewer selling days. "The American people might be questioning their faith in government right now, but they still have confidence in the economy. In fact, American car buyers have been remarkably resilient in the face of the Congress' antics over past year. There's no reason to believe that auto sales will suffer in the coming days or weeks as this mess gets sorted out in Washington." I think a bigger drop in auto sales could come after the shutdown (whenever that is) if the debt ceiling issue turns into a larger financial crisis. Until then, it's just wait-and-see for automakers as the shutdown drags onward.